Pattern colour: Pronotum with yellowish lateral margins. Pronotoum: See 'pattern colour' above. Overwintering: Adults overwinter from September to mid April. Other notes: Similar to H. glabra and H. hannoveriana. 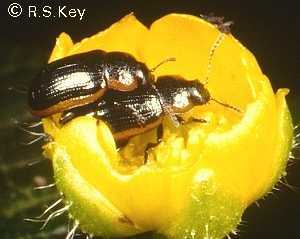 Separated from H. glabra by the orange-yellow lateral margins to the pronotum (not present in H. glabra). Separated from H. hannoveriana by the lack of a median elytral stripe (usually present in H. hannoveriana); in specimens of H. hannoveriana where this is absent, the aedeagus may need to be examined in - in H. hannoveriana, the tip has a slight angle near the tip (lateral view), in H. marginella, the tip is more-or-less straight or slightly curved (no angle).